Persian Cat Facts. Know Your Persian! Persian cats are a very old breed. So old, in fact, that their origin can be traced together with the origins of human civilization. First records of Persian cats’ existence date to the times when Mesopotamia was the world’s most advanced civilization. This region was later incorporated in the empire of Persia (seated in modern-day Iran and Iraq), which is where the breed gets its name from. In some periods of history, Persian cats were smuggled along with jewels and spices out of Persia and considered contraband. Since they were valued as much as spice and jewels, it is then easy to see why they have become symbols of wealth and sophistication. Persian cats have won the hearts of European people in 17th century. It all began when Pietro Della Valle, a renowned world traveler and Italian nobleman, brought first of these longhaired cats back with him to Europe in year 1626. For a very long time, Persian cats have been categorized as “Asiatic”, together with breeds originating from Iran, Turkey, Afghanistan and other exotic places, and were crossbred with them. This changed in late 19th century, when they were popular to breed and showcase. Queen Victoria has been known to own two blue Persian cats. Her fondness for Persian cats has been a major factor in establishing status this breed enjoys in our society from the Victorian era to this very day. Cat Fanciers Association officially recognized them as a breed in 1914. They are now the world’s most popular and loved variety of domestic cats. Cat fanciers started molding Persian cats to their present-day physical appearance through selective breeding. Their round heads, flat faces, chubby cheeks, snub noses, big round eyes, small and rounded ears and sturdy bodies are traits which have all been carefully planned for generations in advance. Back in the old days, Persian cats had silky, shiny gray fur. Selective breeding has overtime broadened the array of variations in which their fur appears. They can now be found in a kaleidoscope of colors: golden and silver colors, solid colors, tabby colors, smoke and shaded colors, bi-color (mix of white and one other color), parti- colors, and Himalayan. Show quality – the flattest of the three types, with little to no nose elongation. Breeder quality (doll face) – very round with a little bit of nose elongation. Pet quality – not quite perfectly round and with the most nose elongation of the three variations, although still quite small compared to the scale of the entire face. 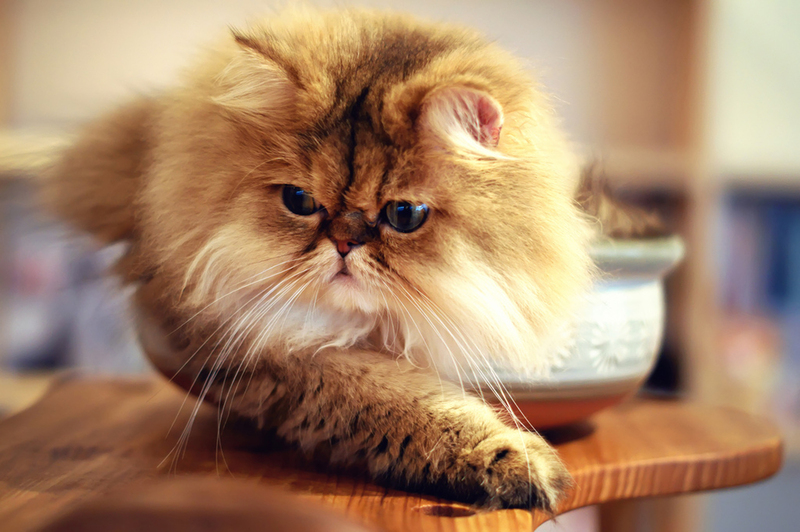 Although majestic when properly groomed, a Persian cat’s long hair can be quite an eyesore and source of health problems if not properly cared for. Depending on the type of hair your cat has, you should groom it at least once every two to three weeks, if not more often. Otherwise, you will see mats and hairballs, no doubt about it. Indeed, most Persian cats that end up in shelters suffer from hair matting because they weren’t properly cared for. Don’t let this happen to your cat! Grooming is not the only thing you have to worry about when you’re thinking about your cat’s wellbeing. They also need regular bath. A month should be a satisfactory time span between two baths. Litter getting lodged in a Persian cat’s paws or coat is also a very common problem, so keeping the litter box as clean as possible is important as well. Excessive tearing is next on the list. Wipe the corners of your cat’s eyes clean every day to stop forming of under-eye stains. Persian cats are best to be kept as an indoor-only pet. They really aren’t cut out for the outdoors, as they fair poorly against other cat breeds, dogs and other wild animals and aren’t as proficient scrappers as their cousins. Not to mention the nature of their hair makes it difficult for them to shed mud, leaves and other dirt. That would just mean you need even more time to spend on grooming. Also, there’s always a risk your cat will be stolen, as many people won’t shy from taking a beautiful cat without paying for it if the owner isn’t looking.